I love french fries. How about you? 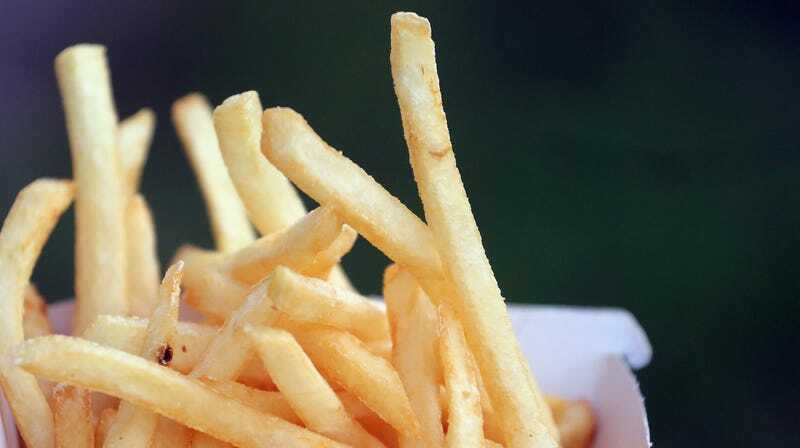 The next victim of this summer of weather hell is french fries. Well, technically potatoes. Harvests in Germany and throughout Europe are suffering due to an ongoing drought. The situation is so bad that a German trade group raised the alarm Tuesday over a potential potato shortage in the coming months. Now what will we stuff our faces with when the existential dread surrounding climate change comes crashing down? The German Association of the Fruit, Vegetable, and Potato Processing Industry BOGK announced it expects fewer and lower-quality potatoes this season and a 25 percent loss in revenue across the agricultural and potato-processing industries. That includes larger potatoes necessary to mass produce our beloved french fries. The drought throughout central and northern Europe—including northern Germany, the Netherlands, and most of Ireland—began only in May, but it’s been an intense one, per the European Drought Observatory. So intense, that it’s contributed to wildfires erupting in Scandinavia. A mixture of heat and lack of rainfall has thrown the region into a drought that’s keeping the agricultural industry on its toes. Some farmers aren’t even harvesting their crops this year. Instead, they’ve opted to destroy them because the conditions have left them unmarketable, reports Bloomberg. This is a preview of the future. Droughts are expected to increase throughout Europe as the global temperature rises and confuses our climate patterns. Germany, in particular, is dry AF. Good luck trying to find a section of land whose soil moisture isn’t at least in severe drought. The country produced more than nine million pounds of potatoes in 2013, the most recent numbers available from the National Potato Council. That’s good for the sixth-largest potato producer in the world. In May, the European Drought Observatory had forecast rains to return around this time of the year, but it’s been a waiting game. Some rain should be hitting parts of Europe in the next week, per the Climate Prediction Center, but not nearly enough for the central and northern regions that need it. In the meantime, hold your fries tightly, friends. They might just be in short supply soon.